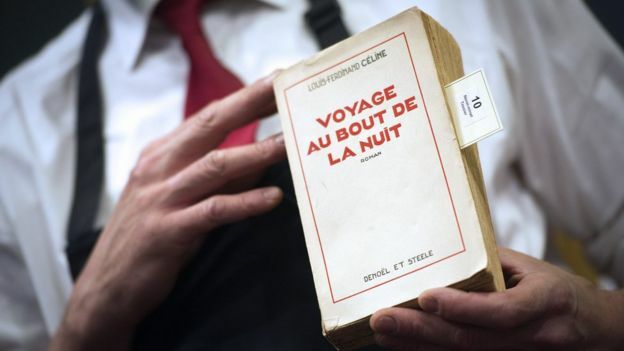 One of France’s main publishing houses has suspended plans to republish a collection of anti-Semitic writings by author Louis-Ferdinand Céline. Céline is regarded as one of France’s greatest 20th-century novelists, but his reputation was tarnished by his anti-Semitic writings. Jewish campaigners said the essays incited racist and anti-Semitic hate. The vitriolic pamphlets were written between 1937 and 1941. He did not want them republished after the war. Last month, Gallimard announced plans to republish a 1,000-page collection of the controversial texts, which are available on the internet and in an edition issued in Canada in 2012. It said the intention was to put them “in their context as writings of great violence and marked by the anti-Semitic hatred of the author”. But the plan sparked protests and a threat of legal action from French lawyer and Nazi-hunter Serge Klarsfeld. The founder of the group Sons and Daughters of Jewish Deportees from France called the reprint “irresponsible”. In a rare move, publisher Antoine Gallimard was summoned by the head of the French government’s committee against racism, anti-Semitism and anti-LGBT hatred, who reportedly urged the publication to have notes by a group of experts, including historians. Gallimard reportedly rejected it. In announcing the suspension of the project, Gallimard said he could not ensure “a proper job in terms of methodology and history”. Céline, who died in 1961, is regarded as a literary innovator and most famous for his 1930s novels Journey to the End of the Night and Death on Credit. His pamphlets are not banned in France but have not been reissued since 1945. Although the author, born Louis-Ferdinand Destouches, had said he did not want them to be republished, his widow, now 105, recently authorised a reprint. He fled to Denmark at the end of World War Two and was convicted in absentia by a French court for collaboration with the Germans. He served a one-year jail term in Denmark and returned to France years later.